This Maker will never have to think about leveling or Z height again. 3D printers are great pieces of Maker equipment, but they don’t work so well if the bed is not level with the extruder. Aligning these two elements together is commonly known as “bed leveling” or “tramming,” and, although simple in theory, needs to be highly accurate. Jeremie Francois decided to combine automating this process with setting the Z-axis offset (important when using multiple extruder heads) using a bed supported by lead screws on three stepper motors. The motors that Francois used came pre-assembled with a lead screw, and throwing conventional wisdom aside, chose to use the screws to both drive and guide the bed. These “multi-use” lead screws are then independently controlled to touch a force sensitive resistor attached to the extruder head in different positions in order to level the bed. You can see the procedure in the video below, where he manually adjusts the bed into an offset position. The stepper motors then automatically adjust the bed in calibration mode. Once this is done, the Z-axis can be controlled in “transparent mode” where all three steppers rotate in unison. This allows the calibration motors to act like a normal Z-axis when using the main Arduino Mega (ATmega2560) to control a print. If you’d like to get a better look at the code for this project, be sure to check out Francois’ GitHub page. This entry was posted in 3D Printing and tagged 3D printer, 3D Printing, 3D Printing Auto Bed Leveling, Hardware Autocalibration, Tribed on February 4, 2016 by Jeremy S Cook. Skriware wants to make 3D printers as ubiquitous in our homes as more conventional 2D printers. Although 3D printers have become more accessible throughout the years, many of today’s affordable models still require some sort of 3D design expertise or CAD knowledge. Cognizant of this, Daniel Losinski set out to create a machine that was intuitive enough for anyone to use, despite their skill set or age. Specifically, he wanted to build an in-home unit that would stand out in a market full of bulky, complex and expensive printers. With the help of his Stockholm-based team, Losinki has launched Skriware along with a 3D printing marketplace dubbed Skrimarket. This nifty combination allows Makers to print directly from the online hub with the touch of a button. Skriware is a wireless gadget that boasts both Wi-Fi and Ethernet connection, and features a full-color LCD touchscreen with a user-friendly interface, a USB port for seamless transferring of files, and an easily removable magnetic print bed. Though it was crafted to be both affordable and simple to use, the startup touts that the 3D printer is extremely durable, and provides high-quality results that go toe-to-toe with professional-grade equipment. Moreover, Skriware not only supports standard PLA filaments, but PET-G recycled materials as well. Great news for environmentally-conscious Makers! What really sets Skriware 3D printer apart is that it can be connected to the Skrimarket. With one click, Makers can 3D print designs directly from the online marketplace. There’s no need to adjust, change or process the file. You just choose the model, hit “print” and you’re all set! Within minutes, an object appears on your desk. And for the more experienced bunch, have no worries — you can also download and edit the files available on the Skrimarket. Skriware measures 330mm x 345mm x 425mm (13.1” x 13.5”x 16.7”) in size and offers a print area of 150mm x 150mm x 130mm (5.9” x 5.9” 5.1”) with up to 50-micron print layer resolution. Meanwhile, the printhead speeds vary for different sections of the print. Outer perimeters have the lowest print speed of 25-40mm/second, as they are crucial for print quality. Infill is printed with 60-80mm/second and travel speed is up to 150mm/second. Sound like the 3D printer for you? Head over to Skriware’s Kickstarter campaign, where its crew is currently seeking $50,461. Delivery is slated for April 2016. This entry was posted in 3D Printing and tagged 3D printer, 3D Printing, Kickstarter, Skriware on December 3, 2015 by The Atmel Team. This incredible fast 3D print creates objects at the speed of one centimeter per minute, without sacrificing quality and accuracy. Do you feel the need, the need for 3D printing speed? Then one Rome-based startup has quite the thing for you. Nexa3D has unveiled what they call the NX1 3D printer, which boasts printing speeds of up to one centimeter per minute, a rate the company claims is 40 times faster than others on the market and roughly half the price. Using their patented LSPc (Lubricant Sublayer Photocuring) technology, the NX1 is being billed as the quickest desktop 3D printer to date — a completely standalone device equipped with Wi-Fi access, a native OS and an accompanying app that enables you to print from anywhere. Powered by four mechanical arms, the NX1 is able to churn out whatever 3D-printed ideas come to mind with ultimate speed — all without sacrificing accuracy and resolution we’ve come to expect from SLA machines. Featuring a sleek unibody frame, the printer combines high quality engineering with an overall experience that’s user-friendly in every way possible. The NX1 offers a build volume of 4.7” x 3.5” x 7.9” (120mm x 90mm x 200mm). Unlike other printers, NX1 doesn’t need screws and bolts either. Instead, the platform is anchored in place with magnets. Whereas other desktop devices depend on a refill process that involves everything from bottles to gloves, NX1’s unique design employs an integrated resin cartridge system that eliminates any headache-causing refills in the middle of a print job. Simply put your resin cartridge in the slot and the NX1 takes care of the rest. Upon completion, the machine automatically recaptures and reuses any remaining resin left in its tank, making it ready for the next print job without wasting a drop. Forget about waiting hours upon hours for your high-res object to be finished, the NX1 will have your job done before you can even finish your cup of morning coffee. For instance, a 50mm x 50mm x 50mm cube takes roughly seven and a half minutes, compared to the 250 and 260 minutes of an FDM and SLA printer, respectively. Ready for a new era of 3D printing? Then head over to NX1’s Kickstarter campaign, where the Nexa3D crew is currently seeking $170,133. Delivery is set for March 2016. This entry was posted in 3D Printing and tagged 3D printer, 3D Printing, Kickstarter, NX1 on November 20, 2015 by The Atmel Team. Rather than spend thousands of dollars on a 3D printer, this Maker made his own out of a DIY CNC machine and a 3D printing pen. 3D printers have come a long way over the past couple of years. However, even despite their ubiquity, many of these machines are still pretty darn expensive. The more impressive devices can run anywhere from $2,000, while DIY kits can still set you back a couple of hundred dollars. Instead, Tinkernut developed a way to build his own for less than $100. How, you ask? By hacking a $45 3D printing pen and transforming it into an entire printer. 3D printers are comprised of four basic parts: a bed, filament, a hot end and an extruder. In the video below, Tinkernut elaborates upon his decision-making process as well as the steps that he had taken in bringing the project to life. 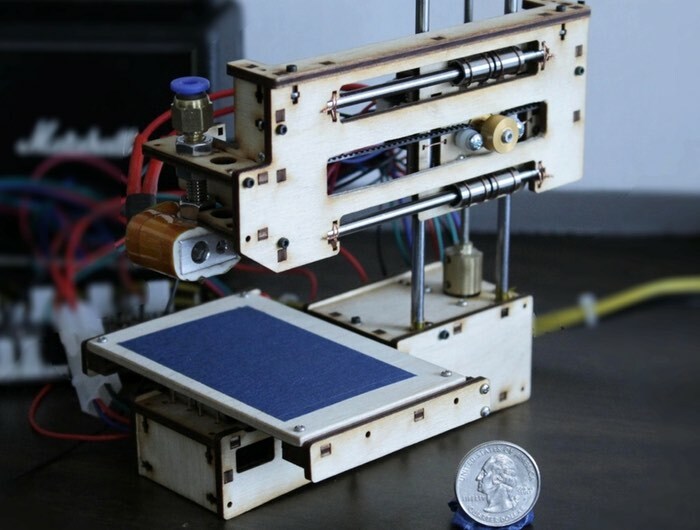 For the bed, the Maker employed parts from an old three-axis CNC router that he built out of CD drives, which is connected to a 3D printing pen for the hot end and extruder. According to Tinkernut, the pen made for a better choice than a hot glue gun, especially considering the fact that it already came with built-in extruder functionality. Tinkernut’s pen featured three standard buttons: thickness, backward extrusion and forward extrusion. He proceeded to tear down the handheld gadget so that he could automate the latter, which would be simulated by an Arduino Uno (ATmega328) to turn the system on and off. Admittedly, the makeshift machine is a bit restricted when it comes to the size and resolution of an object that it can print, but hey, it’s $100! You can follow along with Tinkernut’s exhaustive build here, or simply watch it in action below! This entry was posted in 3D Printing, Arduino and tagged $100 3D Printer, 3D printer, 3D Printing, Arduino, Arduino Uno, ATmega328 on November 19, 2015 by The Atmel Team. As the saying goes: One man’s trash is another Maker’s 3D printer. Electronic waste (or e-waste for short) is an interesting side-effect of our high-tech world. Sure, your Pentium II computer was still pretty cool after it survived “Y2K,” but by 2010 or so it was probably in a landfill. Making this even more wasteful is the fact that there were probably working motors and mechanical components that could have been salvaged from it. If there were a good way to collect these components, and something they could easily be used on, that might make a dent in e-waste. 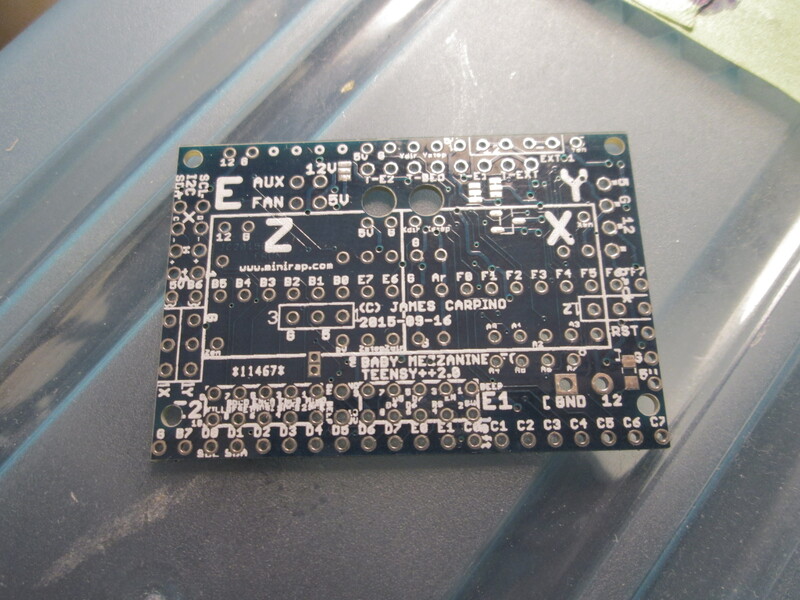 The kit that they have available includes a laser-cut frame and an Arduino Mega (ATmega2560) with a RAMPS shield for print control. You, as the end-user, need to supply two DVD drives and a floppy drive, as well as a power supply and tools. I could definitely see this printer being quite a bit of work to build, since you have to “harvest” parts, but coming in at just under $150, their build kit is attractively-priced and should teach you quite a bit about how a 3D printer works. This entry was posted in 3D Printing, Arduino and tagged 3D printer, 3D Printing, Arduino MEGA, ATmega2560, DIY 3D Printer, Instructables, Makers on November 18, 2015 by Jeremy S Cook. Baby 3D prints in your hand, gets put away in a shoebox. Whereas a vast majority of companies are constantly looking for new ways to increase the build volume of their 3D printers, one group of Long Island-based Makers have set out to do just the opposite. Their goal? To put a 3D printer right in the palm of your hand. While it may sound like a crazy idea, think about it: Measuring just 6.3” x 5” x 8″ in size, you can bring the aptly named Baby 3D anywhere you want to go. And sure, it may not produce the most high-res objects known to man, it is still capable of extruding objects in less than six minutes. This makes it ideal for those working on a quick project at home, inside the classroom or even while enjoying a cup ‘o joe at the coffee shop. “The purpose is to bring 3D printing to people who can’t fit a large 3D printer into their lives, or would like a small 3D printer for learning, or as a spare 3D printer, or simply for the novelty of it,” its creators explain. If Baby 3D looks vaguely familiar, it’s because the printer is a miniaturized clone of the Printrbot Simple 1405 Edition. The uber mini and lightweight (only 2.5 pounds) machine can comfortably rest in your hand as it prints, while taking up no more table space than a sheet of paper. Designed with the education community in mind, Baby 3D comes in DIY kit form and due to its small form factor, 10 printers can be easily stored inside one case — that’s perfect for classroom storage! What’s more, it is entirely open source, which enables Makers and students alike to duplicate and customize their own. One of its most notable features, however, is its newly unveiled nozzle: the Baby 3D Thermal Barrier, which is about an inch long and will take the hassle out of tiny print jobs. Sound like a handheld 3D printer you’ve always dreamed of? Head over to Baby 3D’s Kickstarter campaign, where it is currently seeking $40,000. Delivery is slated for June 2016. This entry was posted in 3D Printing and tagged 3D printer, 3D Printing, Baby 3D, Kickstarter, Mini 3D Printer, Tiny 3D Printer on November 5, 2015 by The Atmel Team.